This presentation was delivered at the annual meeting of the American Anthropology Association on November 15, 2012 in San Francisco, where several sessions and panels were held to honor Dr. Johnnetta Betsch Cole. She is best known as the only woman to have served as President of two historically Black women’s colleges—Spelman College in Atlanta, GA (1987-1997) and Bennett College for Women in Greensboro, NC (2003-2008). Upon retiring from Spelman, Dr. Cole went on to become an intellectual figure who crossed borders in three disciplines at Emory University as the Presidential Distinguished Professor of Anthropology, Women’s Studies, and African-American Studies from which she retired with emerita status (1999-2002). She was recruited out of retirement and served as President of Bennett College for women from 2003-2008. “Sister Prez,” as Dr. Cole is affectionately known, does not do “retirement” well. In 2009, Cole, who in her own words “flunked retirement” once again, became the Director of the Smithsonian National Museum for African Art. Dr. Cole has taught and mentored a diversity of individuals, including women and Black scholars, and especially Black women and non-white women scholars, who have gone on to make significant contributions in the fields of Anthropology, Women and Gender Studies, and African American Studies. The occasion of the annual AAA meeting allowed me and others to testify to the enduring influence and mentoring legacy of Dr. Johnnetta Betsch Cole. It is always a woman… and so Athena takes a man’s guise to guide the son of Odysseus. And from that myth has come the concept of mentoring as “…someone who imparts wisdom to and shares knowledge with a less experienced colleague.” In the context of this definition, Dr. Johnnetta Betsch Cole has established herself as a woman always available to guide and direct younger colleagues. And, fortunately for us, and her, she did not have to take on the guise of a man like Athena. This essay is an auto-ethnographic exploration of the ways in which one woman’s mentoring has created a legacy rooted in activism, service, purposefulness, and social justice that has inspired others to follow her path. 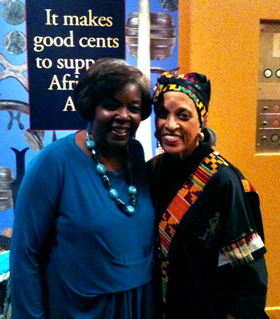 I did not meet Dr. Cole or JB, as she is affectionately called by many, as an anthropologist. In fact, the first time she handed me an anthropology book back in the early 1970s, after perusing it, I politely handed it back to her with a courteous but definitive “no thank you; it’s B-O-R-I-N-G.” Little did I know that those words would come back to haunt me when I enrolled in a PhD program in Anthropology almost fourteen years later in 1987 and became a certifiable “born-again” anthropologist in 1993. When I first met JB, I was a poet, and so it is fitting that I begin my remarks today by reading a poem I crafted to honor her almost twenty years ago. how did so many come to call you sister ? How did so many languages come to shape your name? You, whose very life is peace. You, whose very heart is love. that is larger than race, that is stronger than language. JBC has been a guide post, a political and intellectual guru, a social activist, an apprentice maker, a teacher of principles, a shaman of social justice, and a shaper of leaders. If we can embrace the notion of a horse whisperer and a ghost whisperer, why not imagine a social activist leadership whisperer? And if we can stretch our minds to conceive of such a thing, then Johnnetta is a shining example of such a whisperer. She is noted for being able to develop strong rapport, her feedback utilizes her strengths of observation from her training as an anthropologist, and she rejects the hierarchical role of Master-student and insists on collaboration. So what does this have to do with mentoring? A mentor, a good mentor is all of these aspects and more. Johnnetta Betsch Cole has served as a mentor to many, myself among them—and I bring you greetings JB from Felicia Gustin, Executive Director of Speak Out, who says you mentored her as well. What has been most significant for me in my mentoring relationship with Johnnetta is how it has grown and evolved. I can only speak from my experiences, but I think many others would agree: Johnnetta, as a mentor, offered us guidance as we struggled to find the right combination of our personal lives and political involvement; as we sought to develop the right metrics by which to measure the efficacy of the numerous roles that we as women, and most especially as Black women, have had to juggle and sustain. Each of us present today embodies some or all of the following roles: mother/spouse-partner/ worker/friend/sister and sistah/ mentor-teacher/professional/ artist/ and soldier for social justice. What I have personally found valuable from the perspective of a mentee is the fact that JBC has not been afraid to openly display the vulnerabilities of her life as lessons to be learned from in order to save those of us who follow in her path the embarrassment of trying to attain an unobtainable perfection. to look at the ordinary in order to find the extraordinary; to seek wisdom and knowledge from multiple sources, especially the folk (our communities, our family, our friends), our schooling, our global activism, our ancestors, our children, our sheroes– one of JB’s favorite terms–and from within ourselves. What Dr. Johnnetta Betsch Cole has taught us most is that the answers, the solutions, and even sometimes the sources of problems, can often be discovered by looking within ourselves and at ourselves. 2. You offer me suggestions that begin with “what I have done” not what I have not done. 3. You offer me people to contact based on folks you have worked with and therefore make your contacts my resource people. 4. You do not split my identity as black and woman into parts….as you offer suggestions that dignify both identities. 5. You ask me to pass it forward and have even brought me people to help and I feel as if I am in a lineage where my link is important. ANOTHER VOICE: (Not-for-profit junior Executive): Your mentorship has helped me in the following ways: fostering insight, identifying knowledge and providing encouragement to take advantage of opportunities. As a young professional, I often forget about the need to reflect and cultivate my ambition in a way that is reflective and thoughtful. Your coaching and leadership teaches me the value of self-reflection around my experiences in the workplace, specifically looking at personality types, varying workplace values and styles, and managing difficult people. FINAL VOICE (Non-U.S. Higher Education Administrator): As you know your mentoring has helped me both professionally and socially. Sometimes [it comes in the form of] direct advice from you and sometimes by you sharing your own live experiences. I remember when I was first appointed …[to a senior-level position] … and had difficulties with the management style of …[my supervisor] and you told me I must consider whether I liked the job I was doing and if I did then I must choose my battles and concentrate on the work I do. Ever since I keep that at the forefront of everything I do and in the most difficult times in my administration I asked whether fighting an issue is worth it. This does not mean that I don’t stand up for my what I believe but I take my time in making some decisions and I reflect on all my options before I make a move. As I reflect on my own personal journey as a mentor, I see/feel the echoes of JBC’s mentoring legacy in my life and in my mentoring experiences. And I have tried to cultivate a tradition of passing on the mentoring baton. • Mentoring is about relationships. • Those who mentor must also determine the boundaries and limitations of the exchange. • I have been fortunate in that my relationship with Johnnetta is also a friendship. • All mentoring relationships may not translate into authentic friendships. • Mentoring relationships can create differing, and sometimes unrealistic, expectations that can result in disappointments, confusion, misinterpretations of intents—I’ve encountered some in my mentoring journey. Notwithstanding the above caveats, it is my privilege to stand before you and attest to the strong mentoring legacy of Dr. Johnnetta Betsch Cole. She not only has made a contribution to the individual lives of her numerous mentees around the world, but significantly, she has helped shape several generations of anthropologists—Black, white, and people of color, women, men, lesbian, gay, and transgendered, people in the global north and the global south, and among old, young, and in between. Thank you for being present in my life over the years. To my readers, I pose to you the following question: Have you honored your mentor lately? Are you carrying the mentoring baton? P.S. Full disclosure. Dr. Johnnetta Betsch Cole is also my daughter’s Godmother.